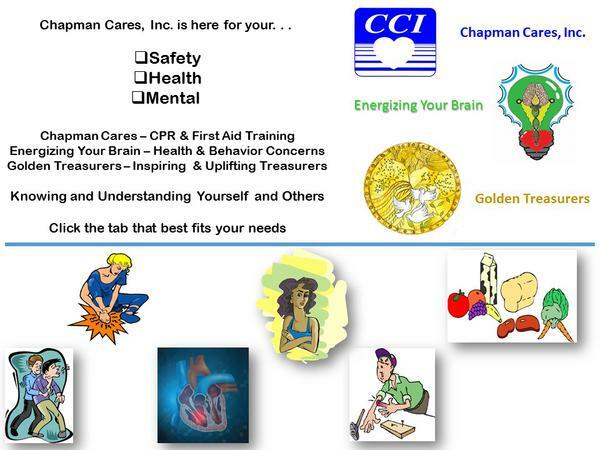 Chapman Cares, Inc. (CCI) is an authorized training center for the American Heart Association (AHA) and the American Safety and Health Institute (ASHI). We have successfully been providing CPR and First Aid training for over twenty years. CCI has all the latest equipment and materials required to give you the newest update in accordance with the AHA and ASHI guidelines. Thinking about an online class? American Heart Association and American Safety and Health Institute is now offering approved online CPR/First Aid Classes. If you have fallen behind in any of your CPR and/or First Aid training, then let us be of service to you. We offer excellent prices and ensure that you meet the requirements for your license while staying well within your company budget. There are special weekly discount that will satisfy your pocket. Upon successful completion of the class, each of your employees will receive a two-year certificate. CCI offers special classes for elementary age children (9 – 12 years old). Would your students know what to do if an accident occured? Learn more about our elementary school program. CCI has many satisfied customers. Here is what some of our customers have to say about our classes over the years. Everyone should take CPR training, that is why we also offer discount gift certificates for our classes. “Life is Why”. Remember, heart disease is still the number one killer in the United States. Call us today at 301-449-1181 to set up training at your location at a time that is convenient for you and your staff. Review our schedule now. There are many amazing things you should know about your amazing heart. Steps should be taken now to keep your heart healthy. Many people give parties to sell things they probably will never use. You should give a party in your home that could save a life. Look at our group rates . Chapman Cares, Inc. cannot be successful without you. Share this site with a friend by clicking below on the "Click here to email this site blue box". Sponsor by Chapman Cares, Inc.
Chapman Cares sponsors many interesting programs to help all their customers to view or participate in. Some of which will deal with many of lifes experiences. There will be workshops, classes, DVD, CDs, interactive blogs, and free information about every day issues. Click here to find out more about the other programs we sponsor.